On Love Books Group Blog today we have an Author Spotlight with T.A. Williams. 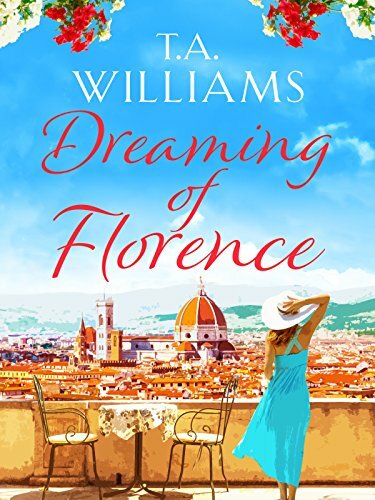 Dreaming of Florence is out now on Kindle. I hope you enjoy today’s feature. I am very old, so that’s a long time ago, but it has to be the Arthur Ransom Swallows and Amazons series – four kids and a dog getting into adventures. How about Madonna’s version of Love Don’t Live Here Anymore? I read lots of books more than once. My brain is so scatty, I forget what happens. One of my favourites is Hilary Mantel’s Wolf Hall. I love it. Left to myself, I would definitely be a go with the flow, seat of the pants sort of writer. The problem is – when you are writing for a publisher, they want you to send them a summary of the book before you start writing. My problem is that my books always start leading me off in their own directions partway through. In consequence, my editor now knows that what I say in the summary and what emerges at the end are often two very different things. I’m not sure I’d use the word “enjoy”. When an editor tells me to do something that clearly enhances the book, I do get some sort of enjoyment out of the process. When I am asked to take out one of my favourite characters or to change one of the main premises of the book, it becomes harder to deal with. And then, when the proofreading editor starts changing all my passives to actives or all my realises to realizes, I have been known to use colourful language. However, there is no doubt, good editing definitely makes a book better. Girls are as scared of you as you are of them. If only I had known. Yes, every word. Including the famous one star review I got for one of my books that just said “Meh”. But quite often people point things out that I am able to use to improve my work in the future. And don’t let anybody tell you differently: bad reviews hurt and good reviews bring sunshine to a rainy day. I’m in favour of it although I do find myself spending an awful lot of time on it. I’m not sure if they were really villains, but I wish Thelma and Louise could have got away with it. Come to think of it, were they “literary”? Warning: contains a happy ending. I read a lot of non-fiction, so at present I am deep into The White War by Mark Thompson about the First World War in Italy. I honestly don’t know where the inspiration for most of my books comes from. Dreaming of Florence, though, is mildly autobiographical. I shared Debbie’s experience of living and working in Florence, teaching English to Italians and learning their language. As for the plot, who knows? Like I said above, my books tend to take on a life of their own as I write them. Stuff just sort of happens… Sorry, that’s such a weak answer, but I honestly don’t know where the ideas come from.